One of the great things about living in Rome is that you frequently discover something new in a nook or cranny of the city that you think you know inside and out. A good example is the Roman Forum, a place I’ve visited dozens of times over the past 20 years. 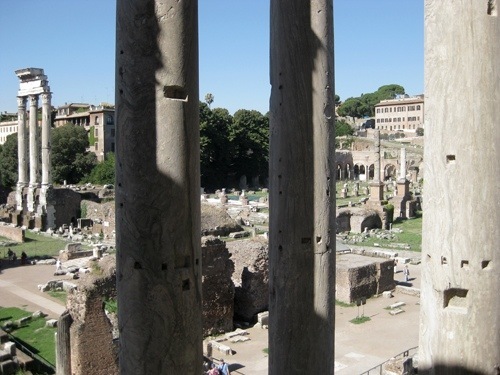 I first started visiting the Forum before the fencing was erected around all of the monuments. You could walk all over the Basilica Julia, pound the Augustan pavement of the square, and admire the blobs of melted bronze on the floor of the Basilica Aemilia, possibly the remains of coins knocked to the ground during Alaric’s sack of Rome in AD 410. There was also that golden period, between 1998 and 2008, when the Forum was open to the public for free all day long, acting as just another way to get from Via dei Fori Imperiali to the Colosseum valley. So I thought I’d seen everything, including—thanks to my position at AIRC—many special structures and ongoing excavations closed to the public. A couple of weeks ago I was surprised to learn, while reading a recent book about the Forum, that the church of San Lorenzo in Miranda, which occupies the Temple of the Deified Antoninus and Faustina, is open to the public, but for only two hours a week (Thursdays 9-11). After kicking myself for never having thought to investigate that possibility, I visited the church on the next Thursday and was received by a very formal but friendly gentleman from a bygone era who gave me a rapid tour of the artistic treasures housed in the church (as well as an earful about its increasing isolation in the archaeological zone) and then turned me loose at the old doorway facing out onto the Forum, now a balcony floating about 25 feet above the ancient levels. 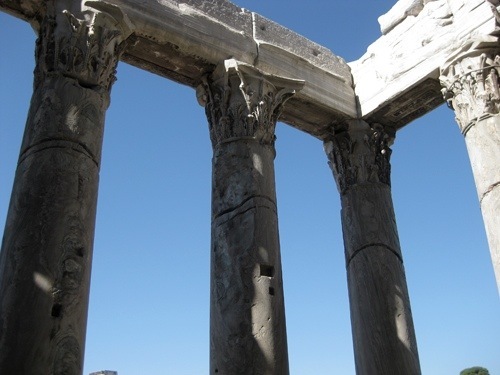 Although the view is obscured by the columns of the porch, the experience is nevertheless a feast for the eyes, offering a fresh and fascinating perspective on the temple itself, the Forum, and the Palatine hill. In Rome, fortune really does favor the bold. And the curious. Well, first of all, let me tell you that most of my spare time is spent at cafes around Rome. I sit and drink, and then creativity fills up my glass (after having finished work of course….say what!?). And most of the time, I always meet people who have something to interesting to share. The other day I was hanging out at one of my favorite bars in Rome- Bar del Fico– where I met a couple from France. The woman, Nadia, was a professor of medieval philosophy but I prefer to call her my new French-Algerian encyclopedia. She was modest and didn’t reveal her academic credentials until well into the evening and when she did, oh my goodness, did she know everything about, well…many things! What stood out the most though was the mannerism in which she spoke about the country of her forefathers: Algeria. Nadia’s eyes almost filled up with tears when she described to me how, unfortunately, many Algerians do not know the history of their country, their nation, and their identity. As history is very important to me, I was nostalgic but yet not surprised to learn that there is a huge lack of awareness of historical identity in Algeria. 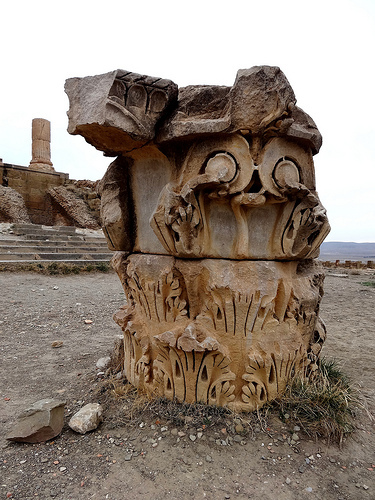 Nadia continued to tell me that the preservation of archeological sites and monuments is in absolute miserable condition in Algeria. 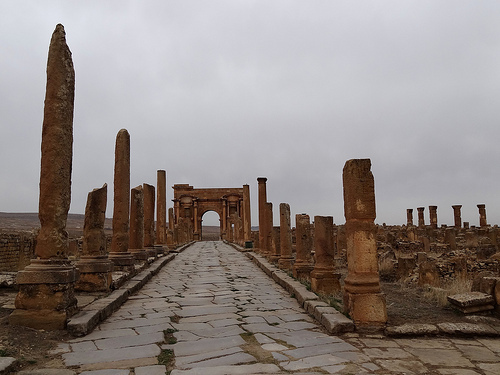 Ancient Roman columns are used as ashtrays, marble statues are covered with graffiti, historically significant sites are in disarray, and in general, citizens are not aware of the rich cultures that make up Algeria’s dense and mosaicked history. In fact, those casually castaway artifacts represent millennia of Algerian culture: Carthaginian, Roman, Vandal, Byzantine, Caspian and Arab Umayyad cultures. My conversation with Nadia that evening made me realize that though I am working to promote preservation of archeological sites in Rome and trying my best to emphasize the importance of cultural heritage, there is so much work to be done around the world. Rome is the eternal city but not the only one in need of dedicated people who try to teach history for sake of understanding our contemporary society. 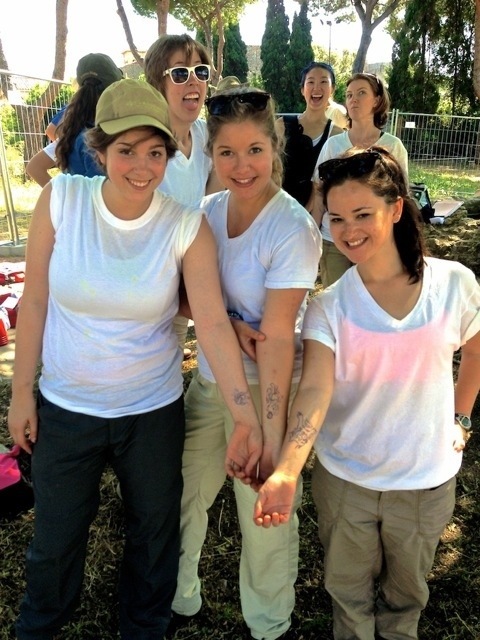 As we seek relief from Rome’s sweltering triple-digit (F) temperatures, it’s a good time to look back at six weeks of fun, hard work, and intensive learning. Here are a few things that struck me, in my capacity as Project Coordinator, about the experience. Low injury rate. During the course of a typical season we see a handful of cuts or scrapes that require on-site medical attention, as well as a lot of first-week blisters that exhaust the supply of band-aids in no time. This year we had only one cut, thankfully, and not even one band-aid was used. Plot twists. We started out assuming that the Roman mausoleum in Area B was, at some point after the end of antiquity, transformed into a baptistery, which was subsequently re-worked to accommodate six tombs in the Middle Ages; two bodies were duly found in one of these tombs in the fall exploratory campaign. In the summer not even one additional burial was found in the tombs, while a series of burials was revealed just below the ground surface around the edge of the mausoleum. Proof that, in archaeology, assumptions are made to be modified and abandoned. Gastronomic adventures. This year everyone looked forward to lunch, which was prepared and served at La Fraschetta del Borgo in Ostia Antica, a stone’s throw from the site. Solideo and the staff served up 23 tasty and abundant lunches, catering to all dietary needs, including prosciutto with cantaloupe, cold cuts and cheese, rigatoni all’ammatriciana, frittata (omelette), pizza, sausage with chicory, and chicken cacciatore with potatoes. The daily dose of gelato was especially popular. Language lessons. 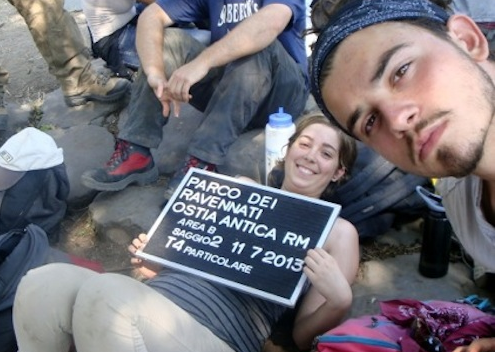 Every edition of AIRC’s Summer Archaeological Field School involves bilingual staff, so you can always hear both Italian and English spoken on-site. This year’s Babel had a particular feel to it. There was the lilting British accent of our Welsh topography intern, Tim Penn. There was archaeologist Larisa (“Larry”) Criscenti’s elegant and studied English. There were the participants’ gung-ho attempts to learn Italian from field director Michele Raddi’s colorful diction. 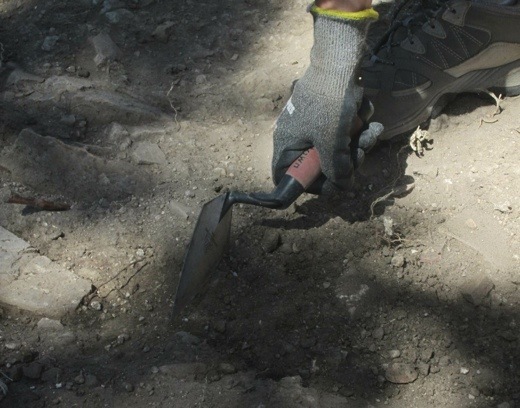 My favorite moment was the attempt to explain to our Italian colleagues the subtle acoustic distinction between “mortar” and “murder.” Two very different concepts, but both very useful in a Roman archaeology field school. Can’t stop talking about your study abroad experience? 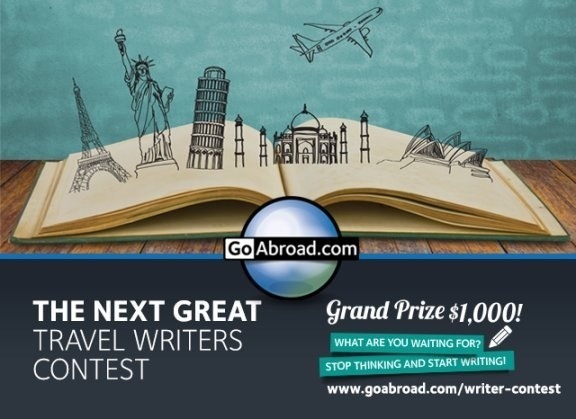 Put it in writing for the GoAbroad.com”Next Great Travel Writers Contest” and show your friends your words are worth a lot. 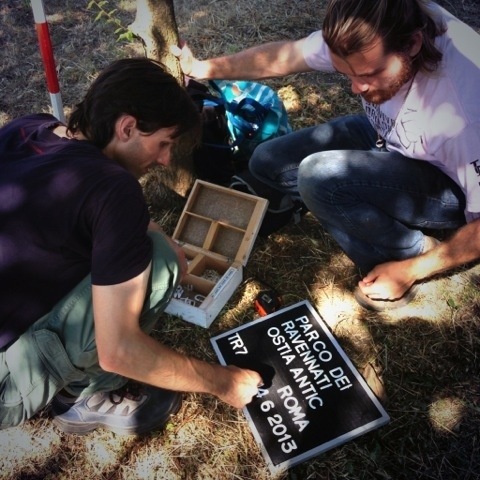 La Soprintendenza speciale per i beni archeologici di Roma, con l’American Institute for Roman Culture, presenta i risultati delle più recenti ricerche effettuate nel Suburbium di Ostia antica. L’appuntamento con gli archeologi e con gli studenti di archeologia di 14 università del Nord America è fissato per venerdì 19, alle ore 10.00, all’angolo fra via dei Romagnoli e via della Stazione di Ostia antica (v. mappa).